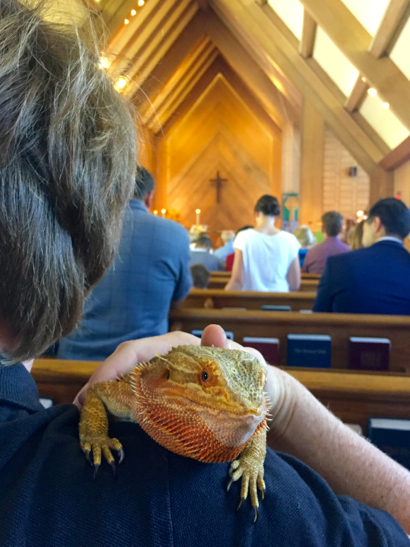 Pets were invited to come with their people this morning at Trinity Church in Menlo Park. The blessing of pets and animals is often celebrated near the feast of St. Francis of Assisi on October 4. Most of the pets in attendance were dogs, who were, all in all, well-behaved with just an occasional bark ringing out, sometimes at an appropriate time. 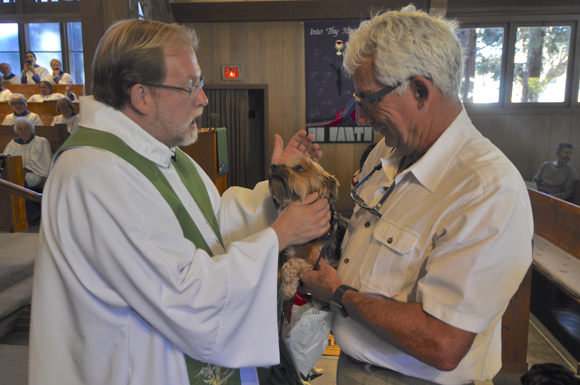 Maggie the Yorkshire Terrier appears to take her blessing from Father Matthew seriously. Cat lovers were smart enough to leave their feline companions at home. But there was one bunny, and our candidate for star of the show, a lady lizard!